As long as your existing shipping container is empty we can have a driver come to your location, pick up your empty shipping container then deliver it to the new location. If you’d like a quote, please fill out the get a quote form on the home page and include existing size of shipping container to be moved along with pick up address and new drop off address. We’ll respond right away with a quoted price to move your shipping container. Loaded one time with freight and shipped to the US then put up for sale. Our 20 foot shipping containers or 40 foot shipping containers will be approximately 1 to 3 years old and come painted. They could have little to no surface rust, and a few to no dents. The doors, seals, floor, cross members and welds will be in excellent condition. This is as new of a shipping container as you can purchase. Loaded with freight multiple times, these 20 or 40 foot cargo containers are then put up for sale. They will have surface rust and dents. The doors, seals, floor, cross members and welds will be in good condition. This cargo container meets the requirements of being surveyed and certified to be put back on the railroad or cargo ship. We guarantee no holes, doors in working condition, seals without rot and the flooring attached to the cross members and intact. Loaded with freight many times then put up for sale. They will have surface rust, dents, stiff doors, possible rotted seals, scratched or even lifted floors, possible cross member and weld corrosion and could potentially have holes. Wind and Water Tight does not always mean Wind and Water Tight. There are no guarantees on these 20 foot shipping containers or 40 foot shipping containers. Loaded with freight many times then put up for sale. They will have heavy surface rust, dents, stiff doors, rotted seals, scratched or even lifted floors, cross member and weld corrosion and will have holes. 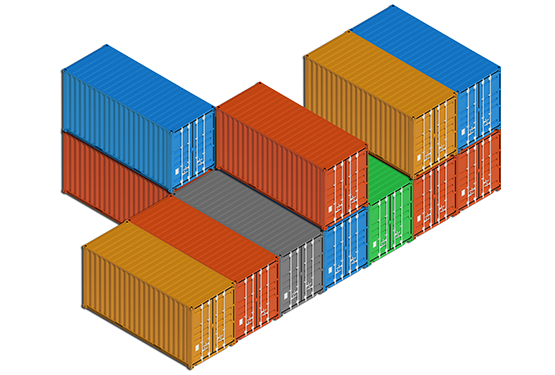 These are very low-end shipping containers with no guarantees. We offer multiple sizes to choose from when purchasing an Ocean Container. Check out our specifications to make sure you get the right size needed for your cargo needs!